Today as part of kid’s week I am focusing on kid friendly breakfast ideas. I know we’ve all heard it before, breakfast is the most important meal of the day. But do you know why? Kids who don’t eat breakfast are less able to concentrate at school, get less vitamins and nutrients in their diets, and are more likely to gain weight because skipping breakfast means more calories are eaten throughout the day. But we all know that school mornings (or workday mornings, if you don’t have kiddos) can be extremely hectic and honestly sometimes breakfast is the last thing on your mind. Below are some useful tips and tricks on how to make sure you and the kids get a healthy, energy boosting breakfast and not break a sweat. • Prep the night before. Most people prepare their lunches the night before, but why not breakfast? There are many breakfast options that can be made at night. Throw some fruit and yogurt in a Tupperware and store in the fridge. Place a muffin and extra piece of fruit in the lunchbox for breakfast on the go. Hard boiled eggs keep in the refrigerator for about 5 days and are great to grab with a piece of fruit. For a hot breakfast I love these Make-Ahead Muffin Melts that are just heated in the toaster oven or under the broiler in minutes. Or how about breakfast made in the crock-pot? • Bake, freeze, and re-heat. Store bought frozen waffles or pancakes are extremely convenient and there are actually some pretty healthy and good quality options now available. Unfortunately these things can add up on the weekly grocery bill, but can be made at home for pennies. Simply prepare pancakes/waffles according to directions. Cool completely. Place cooled pancakes/waffles on baking sheet in a single layer and freeze for 6-8 hours. Once frozen stack and place in freezer safe packaging. To re-heat, place in 350 degree oven for 15 minutes, or heat in toaster, or microwave for 1-2 minutes. Muffins or quick breads can also be prepared in advanced and frozen. To thaw the muffins, remove from freezer the night before or microwave for 1-2 minutes wrapped in a paper towel. Looking for some great make ahead and freeze pancake or muffin recipes check out these: Oatmeal Pancakes; Pumpkin Pancakes; Pumpkin Spice Muffins with Streusel Topping; Cranberry Pumpkin Bread; Peanut Butter Banana Bread. • Teach the kids. Children love helping and hands on activities, so why not let them make their own breakfast in the morning? Younger children can spread peanut butter or cream cheese on pre-sliced bagels, bread or tortillas. String cheese, fruit, yogurt and granola bars are all easy to grab choices for children. Older kids can fix cereal, toast, microwave cooking, and even making smoothies. Today’s recipe is a fun one! 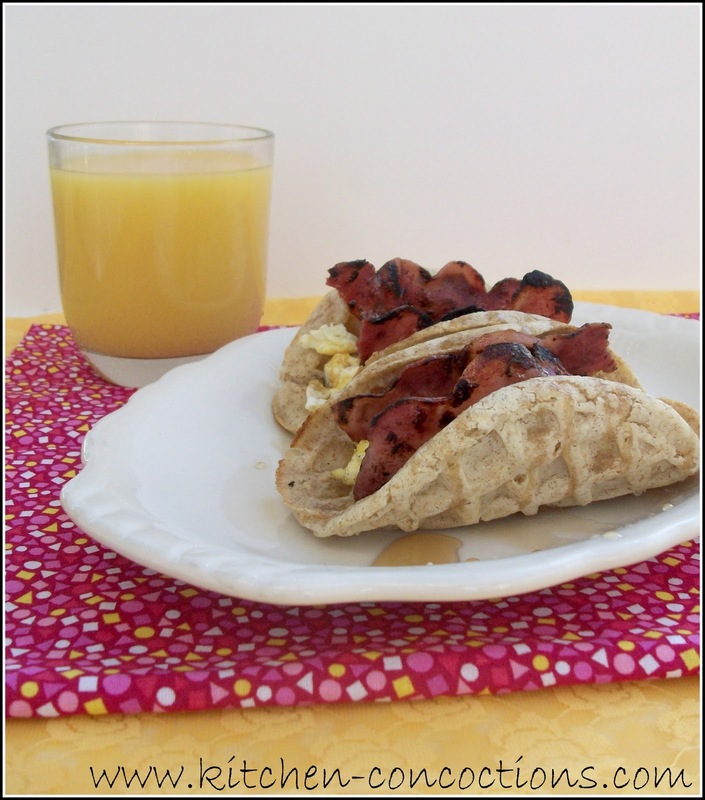 Being from Texas I know a thing or two about breakfast tacos, but I just couldn’t get over this fun twist on that ole’ breakfast taco. 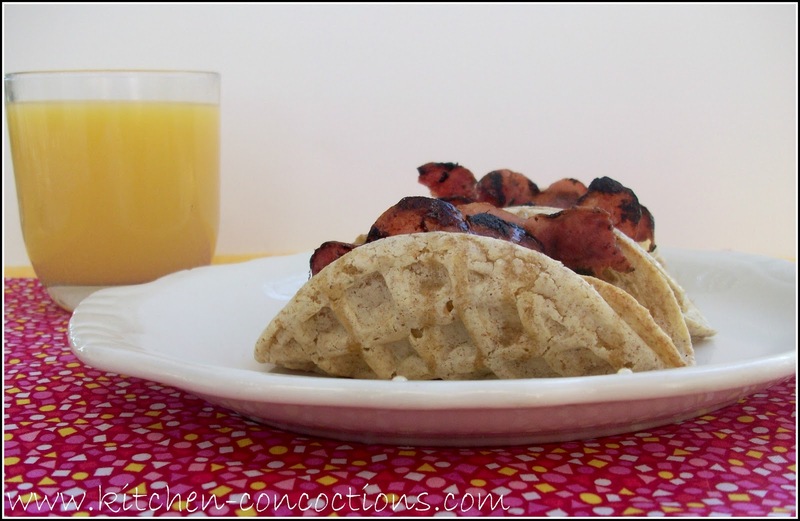 Kids will have fun rolling out the waffles and dipping this Waffle Taco in a side of syrup, and the sweet/savory combo is perfect. Bake it until crispy and firm, about 5 minutes. Carefully remove the waffle taco shell. While, waffle is heat sauté pan over medium-high heat cook bacon until crisp, for approximately 3 minutes. Set aside and keep warm. Whisk egg and add to skillet. Cook until scrambled, for approximately 1 minute. Serve scrambled eggs and bacon in waffle with maple syrup on the side.